Former Berkshire, Sunbury, Trenton and Galena Fire District Chief Jeff Wilson in March 2017. 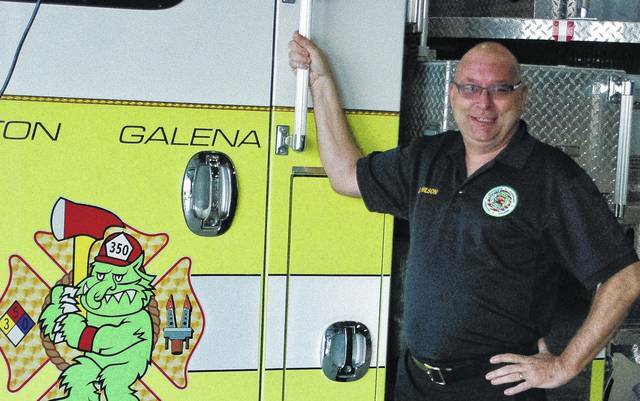 Former Berkshire, Sunbury, Trenton, and Galena (BST&G) Fire District Chief Jeff Wilson passed away last week, but he left a legacy that will live on in Delaware County. Wilson, 54, retired from the fire district on Jan. 31 after 30 years of service starting as volunteer and later serving as fire chief for six years. Wilson passed away on June 8 after a 17-month battle with Glioblastoma, an aggressive cancer. A funeral service and procession was held Tuesday. Porter-Kingston Township Fire Chief Mike Thompson said Wilson’s legacy extends beyond just serving as a fire chief. “He did a lot for Delaware County that people probably won’t ever realize,” Thompson said Wednesday. He added Wilson did behind-the-scenes work that benefited the whole county, not just his local area. “(Wilson) looked out for everybody, not just his district. He was very county-oriented,” Thompson said. Thompson added Wilson was instrumental in the 911 Center and bringing city and county emergency services together. Wilson was also instrumental in House Bill 277, which passed in 2016 and eliminated double taxation on 911 services in the county. Wilson leaves behind his wife, Marla, and their two children, Krystina (Matt) Fahey and Daniel Wilson. In lieu of flowers, Wilson’s family has asked interested parties to please consider a donation to the BST&G Fire Association, 350 W. Cherry St., Sunbury, Ohio 43074 or the Sunbury United Methodist Church Youth Work Mission Fund, 100 W. Cherry St., Sunbury, Ohio 43074. At Wilson’s retirement in January, Marla read a speech he had written for the ceremony. https://www.delgazette.com/wp-content/uploads/sites/40/2018/06/web1_DSC_1280F.jpgFormer Berkshire, Sunbury, Trenton and Galena Fire District Chief Jeff Wilson in March 2017.